Samba Nights Video Slot Guide & Review - Casino Answers! Samba Nights is a 5-reel, 50-line video slot developed by Cryptologic, featuring stacked wilds, scatter wins and a free spins feature with a multipler. You can play the Samba Nights video slot at Casino Joy and InterCasino. Samba Nights is a Brazillian Carnival-themed video slot. Samba is the type of dance music played at Carnival, which is the most popular holiday in the country of Brazil. Symbols on the Samba Nights video slot include Girl (wild symbol), Beach (scatter symbol), Fire Blower, Trumpet Player, Hand Drum, Drinks as well as Ace, King, Queen, Jack, Ten and Nine symbols. 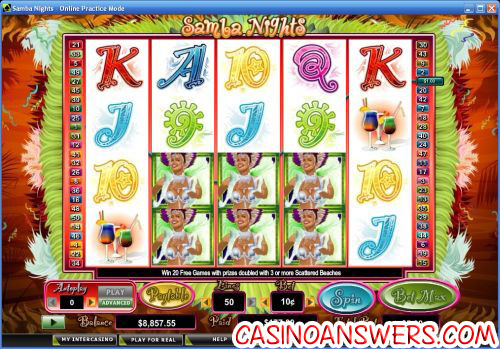 Samba Nights is a 50-reel slot machine, so not only are there many more lines than most other video slots, but there is also an extra row on the reels. Samba Nights is complete with animated symbols and sound effects. Bets on the Samba Nights slot game are $0.01, $0.02, $0.03, $0.04, $0.05, $0.10, $0.15, $0.20, $0.25, $0.50, $0.75 and every increment of a dollar all the way up to $20. You can decrease the number of active paylines by using the arrows next to “Lines.” Casino Answers recommends that you play all 50 lines to all times as to not miss out on potential winning combinations. The lowest total bet you can make on the Samba Nights slot machine is a penny per spin. The highest total bet you can make is $1000 per spin. Samba Nights allows for a large betting range that will suit all types of slots players. To modify the speed of the gameplay, there are three speed controls available: Normal, Fast and Very Fast. To play all 50 paylines, hit the “Bet Max” button or hit Enter. To spin the reels with any other wager, hit the “Spin” button or use the Space Bar. The highest paying symbol on the Samba Nights video slot is the Dancing Girl symbol. To win the 2000 coin top jackpot, you must hit 5 Girl symbols on an active payline. When you hit her symbol, she will become animated and dance while laughing. The Dancing Girl symbol is the wild symbol in Samba Nights, meaning the symbol will substitute for all symbols except for the Scattered Beach symbol. The prize is doubled when the Dancing Girl symbol participates in a winning combination. The wild symbol is also stacked, so it can appear on all positions on a reel. If the Girl symbol appears on all four positions, she will appear as one symbol that covers the entire reel (much like an expanding wild). The scatter symbol in Samba Nights is the Beach symbol. There is only one payout for the scatter symbol, which is 2X your total bet if you hit 3 symbols (you can only hit 3 scatter symbols per spin). Also, when 3 Scattered Beach symbols appear anywhere on the reels of Samba Nights, you will trigger the free spins feature. You will get 20 free spins with a 2X multiplier. The free spins feature can be re-triggered. Free spins are played at the lines and bet of the triggering game. Free spin wins are added to payline and scatter wins. Use the free spins feature on Samba Nights to your advantage by playing for real money at Casino Joy! Payouts are made according to the Paytable. Payline wins are multiplied by the bet per line. The highest win amount is paid on each selected payline. Scatter wins are multiplied by total bet and added to payline wins. Feature wins are added to scatter and payline wins. Winning combinations pay from left to right only, except for the Scattered Beach symbol. The Scattered Beach symbol appears on reels 2-4 only. The wild symbol substitutes for all symbols except for the scatter symbol. The prize is doubled when the wild symbol participates in a winning combination. To use Samba Nights’ autoplay mode, use the arrows under “Autoplay” to select the number of autoplay spins you wish to play (up to 1000) and hit the “Play” button. You can also use the advanced settings, where you can set the win threshold, cumulative win/loss or set it to stop on free games or bonus feature. You can stop autoplay at any time by hitting the “Stop” button in the autoplay box. Samba Nights creates a fun atmosphere that players who are a fan of Samba music and Brazilian culture will enjoy. Samba Nights is in many ways a one-symbol video slot. The Girl wild symbol is what pays out the most, creates most of the winning combinations and dominates the slot game in many ways. The Beach scatter symbol is also important, but it’s also a rare symbol to see more than one of. You can win big by using the Samba Girl symbol on this video slot while playing Samba Nights at Casino Joy! Are players from the United States able to play the Samba Nights slot game for real money? Unfortunately, American slots players are not able to play at Crypto casinos such as Casino Joy and InterCasino right now. Americans can play the Bangkok Nights Video Slot at the US-friendly VIP Slots Casino. Where can I play the Samba Nights slot machine online? Where can I play a Carnaval slot game?